Our church is proud to be the bearer of 6 stained glass windows which were gifted to the church by families of the congregation and elders in memory of their loved ones. We also have a seventh, and very unique one as we believe it is the only one of its kind in the country, which celebrated the coronation of Queen Elizabeth II in 1953. This later window was a gift of the congregation to mark this very auspicious occasion. 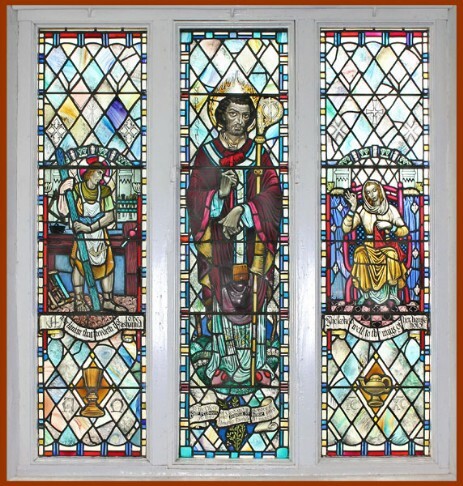 The windows were designed by celebrated artists, such as Douglas Hamilton who captured the wishes of the family in detailing the style and story in stained glass. 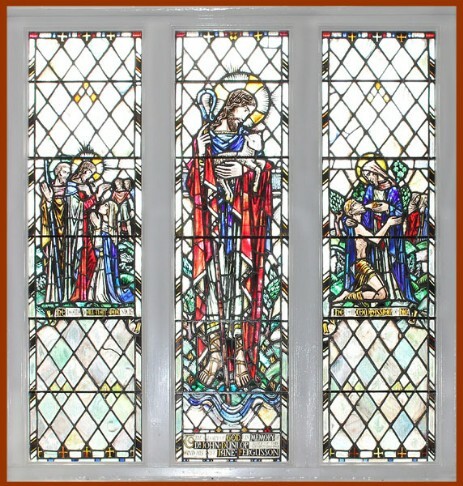 The first window to be installed was donated in 1935 by the Misses Dunlop in memory of their parents, Dr John and Mrs Jane Dunlop. Their father was for many years the much loved and respected General Practitioner (Doctor) of the parish. 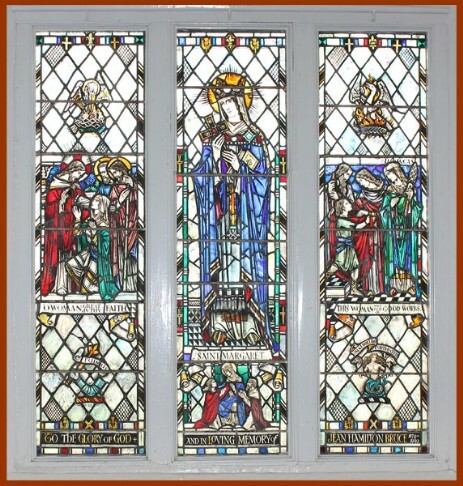 The window is the work of Professor Herbert Hendrie of the Edinburgh College of Art. It shows in the centre panel Christ as the Good Shepherd, a rescued lamb in his arms, while the side panels show - on the left, Jesus healing the sick, and on the right, the Good Samaritan. The middle window on the south side of the church is the gift of Charles Buick in 1964. It is the work of Gordon Webster and shows in the centre panel, Christ depicted in brilliant blues, with the scroll "Lo! I am with you always." The left panel is of Abraham at the sacrifice of Isaac and bears the legend "Thou hast not withheld thy son from me" (Genesis 22:12). The right panel is of Moses giving the law to the people. The third window in the south wall was given in memory of William and Isabella Donald by their son, William J Donald. 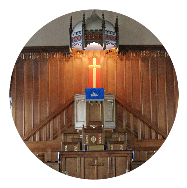 Mr Donald senior was for some years the Sunday school Superintendent of Clackmannan Church. 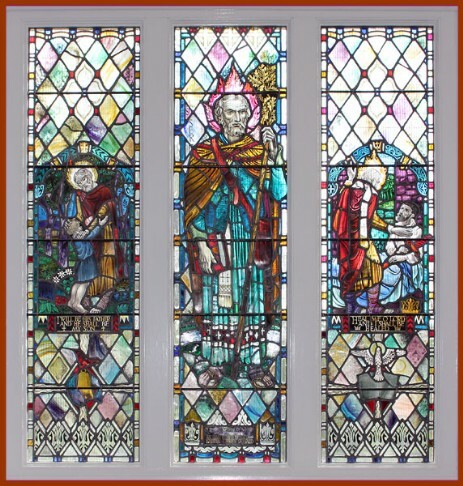 The window was designed by Douglas Hamilton, FSA (Scot) and shows, in the centre panel, St Serf, the missionary to the Hillfoots. The left panel shows God and King David, with the text from 2 Samuel 7:14 "I will be his father and he shall be my son". In the right panel, the prophet Jeremiah pleads with God "Heal me, O Lord, and I shall be healed" (Jeremiah 17:14). William Donald junior left Clackmannan for the United States. The sixth and final window downstairs in the church was gifted by the Hon. Victoria Bruce in memory of her sister, the Hon Jean Bruce, who served for 23 years as Lady-in-Waiting to Queen Mary, at Buckingham Palace. The window was made by Professor Herbert Hendrie. It depicts, in the centre panel, St Margaret, Queen of Scotland. The left panel shows Jesus and the Canaanite woman who pleaded for healing for her daughter and argued with Jesus who told her "O woman, great is they faith" and healed her daughter (St Matthew 15:28). The right panel declares "This woman was full of good works". The text comes from Acts 9:36, and is the story of Tabitha - her name in Greek is Dorcas - who spent all her time helping the poor. She took ill and died, and her friends called for St Peter who raised her. 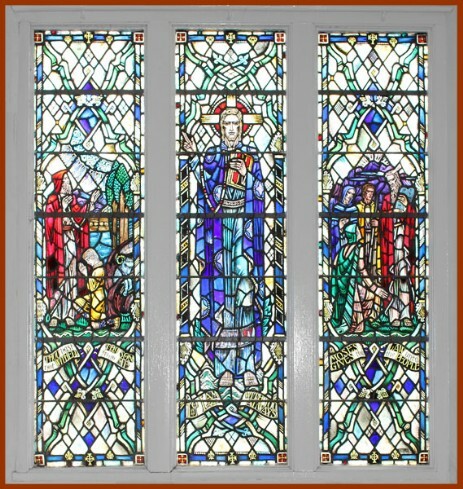 The middle window in the north wall of the church is the gift of sisters Margaret and Mary Buick. It is the work of Sadie Pritchard, and shows the risen Christ in rich golden colours with scenes from his teaching on either side, and the legend beneath "I am he that liveth and was dead, and behold I am alive for evermore" (Revelation 1:18). The scene in the left panel is from St Matthew 25:40 - "Inasmuch as ye have done it unto the least of these my brethren ye have done it unto me", while that in the right panel is from St Matthew 18:4, "Whosoever shall humble himself as this little child, the same is the greatest in the Kingdom of heaven". This window completed the 6 downstairs and was installed in 1966. Mary Buick died in 1992, aged 100 years. 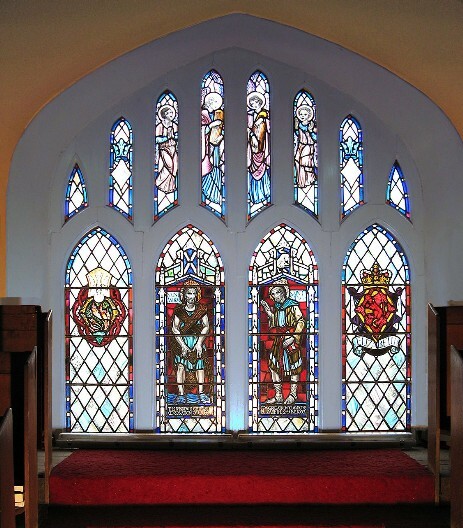 The westerly window in the north wall of the church is also the work of stained glass artist Douglas Hamilton FSA (Scot). It was the gift of Miss Eliza Ferguson in memory of her parents. Her father, Henry, worked in the local wool mill, and Isabella, her mother, was a seamstress. Thus the left panel depicts a wool worker and bears the text from 2 Timothy 2:15, "A workman that needeth not to be ashamed", and the right panel shows a seamstress with the text from Proverbs 31:27, "She looketh well to the ways of her household". That verse in Proverbs concludes ".... and eateth not the bread of idleness". The centre panel depicts St Blasius or Blaise, Bishop of Sebastian in Asia Minor who was martyred in 316 AD. He was regarded as the patron saint of wool-combers and throat sufferers. He is still remembered in some churches on 3rd February each year. In the east wall of the gallery of the church there is the Coronation Window. It is believed to be the only stained glass window installed in any church in the United Kingdom specifically to celebrate the coronation of Queen Elizabeth II. 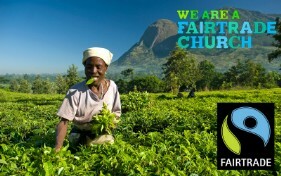 It was paid for by the subscription of the Congregation. The window is the third in the Church to be designed by Douglas Hamilton. 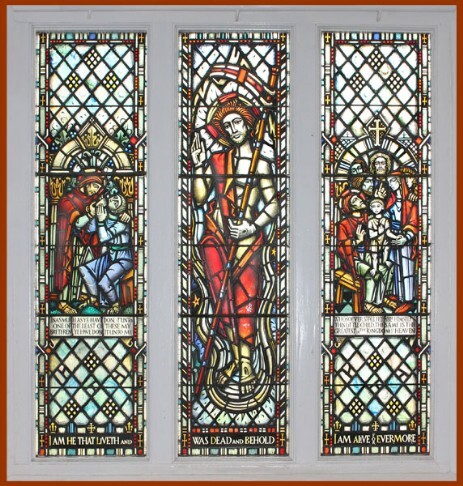 It shows on the left panel the burning bush, the emblem of The Church of Scotland with the dove, representing the Holy Spirit descending towards it; in the left centre panel there is St Andrew with his fishing net; in the right centre panel, St Mungo is carrying his bible on his preaching mission. Tradition has it that St Mungo, the patron saint of Glasgow, who is sometimes known by the name Kentigern, was born around these parts and ordained by St Serf at Culross in Fife. In the right panel is the lion rampant of Scotland, with the crown, and the legend, "Elizabeth". 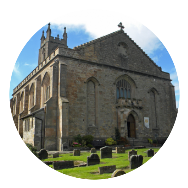 In 1997 the Queen visited Clackmannan Church and saw the window for herself. It is the only one of the stained glass windows in the Church to be floodlit from inside the building, making it visible to passers-by at night. There is one feature that is common to all seven windows in the church. Each of the downstairs windows extends into the gallery where at the top there are 6 lights showing the heavenly choir, complete with instrumentalists, using the colours of the main window. The coronation window continues the same theme.